Laskay is not a ghost town in the formal sense because people still live there. It was founded in 1832 when a dam was erected on the East Humber River to create a mill pond for a sawmill. Joseph Baldwin took over the mill site that year when he bought the 100-acre property. In 1849 he added a grist mill and later expanded with a woollen mill. When he arrived the community had the nickname Bulltown but Baldwin changed the name to Laskay after his hometown of Loskay in England. The Humber River was prone to flooding and the mill dam was often washed out. The buildings themselves were destroyed in the floods of the late 1870’s. By the time of the map above the sawmill was already gone. The Grist Mill and Carding Mill are marked in blue. Fires took out the rest of the mills and by the end of the century, they were all gone. Village lots were laid out on either side of the river on Joseph Baldwin and David Archibald’s lands. From the 1850’s these lots began to fill up with workers from the mills along the river. The town soon had a blacksmith whose shop once stood on Old Forge Road. Travellers along 3rd line west (Weston Road) would seek a place to water their horses and wash the dust from their throats and beginning in 1845 they made Laskay Tavern a regular stop. The tavern was built by Baldwin who constructed a general store and post office next door. Adjacent to that, he built a dressmaking store for his wife to run, a business she shared with her sister. The tavern is in use as a private home today. The town doctor lived in this house on the main street. The side and rear of the house were planted with herb gardens used in various healing ointments and potions. The county atlas shows a Primitive Methodist church in the town in 1877, marked with red on the map. The church itself was absorbed into the United Church of Canada and the building was eventually closed as a church. Today it is marked by Old Church Road on which this interesting house can be found. The walls contain double sets of buttresses with concrete caps as was common on churches around the turn of the past century. It appears that the old wood structure was either replaced or given a new brick cladding around 1908. Today most of the church structure is gone and a house stands amid the old walls. The Laskay Emporium is shown below and in the cover photo. It was one of the main hubs of the community starting in 1856 when it was built. It served the town as a general store and post office for nearly a century. The store had a “Boom Town” front that hid the sloping roof from the street. The veranda has a unique sloping roofline under which the locals would sit to watch the evening fade and smoke their pipes. 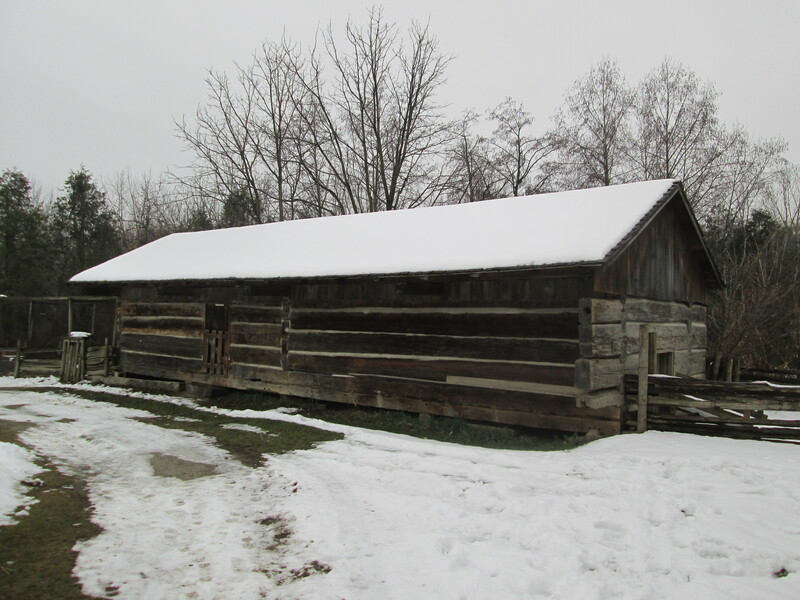 The Emporium closed and sat vacant waiting for demolition until February 19, 1960, when it was rescued and moved to Black Creek Pioneer Village where it is preserved. Joseph Baldwin’s son Henry was the postmaster for 20 years and part of his job was to sort the daily mail into the various slots on the post office pigeonholes. The Post Office is designated with PO and marked in orange on the map. The emporium was the Walmart of the era, importing things and reselling them. All the usual household needs could be bought here. Customers could buy milk by the cup for 2 cents or a lemon for 3 cents. Three cups of sugar sold for 20 cents and eggs were 2 cents each. You could get four cups of flour for 20 cents, a cup of butter for 18 cents and baking soda for 5 cents. For under a dollar you could get the ingredients to make a cake. The cod for your main meal would cost you 8 cents. The Emporium was divided into three rooms on the ground floor with one serving in part as an office. The post master’s desk and safe are seen in this picture. The third room was used to sell larger items and to unpack the crates of imported goods. Beginning in 1852 the Ontario, Simcoe and Huron Railway began stopping at their new station in Springhill (King City) to deliver products from overseas as well as to allow local products, such as grain milled in Laskay, to be shipped to market. 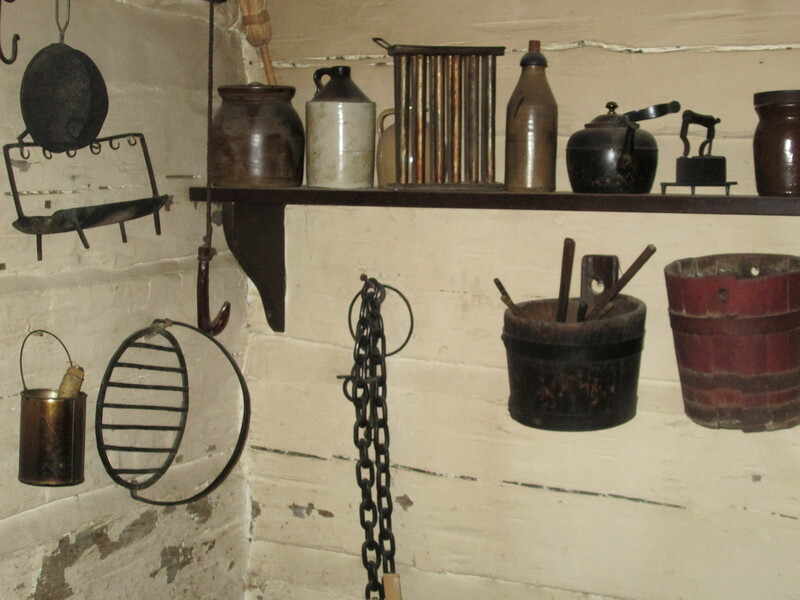 A selection of typical cookware is displayed in the rafters of the Emporium. 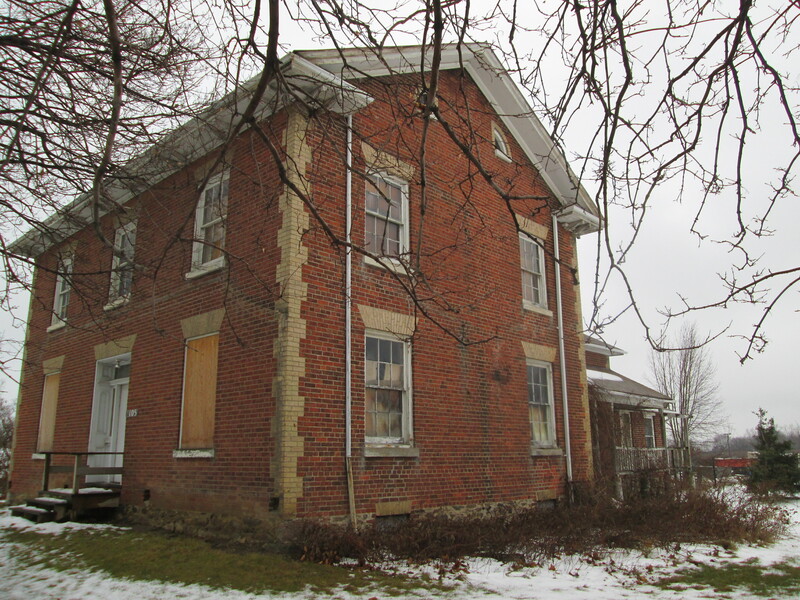 One other building from Laskay has been preserved and that is Laskay Hall which was moved from the town to King Township Museum in 2017. It was built in 1859 by the Sons of Temperance. Since this museum also houses the railway station mentioned above, the oldest surviving railway station in Canada, it will certainly be featured in a future post. This entry was posted in Black Creek Pioneer Village, Humber River, Uncategorized and tagged Humber River, Laskay Emporium, ontario simcoe and huron railway, post office on November 11, 2017 by hikingthegta. My wife and I were married at the Fisherville church which is now located at Black Creek Pioneer Village. We have made a tradition of enjoying their Christmas By Lamplight and Christmas Dinner ever since. 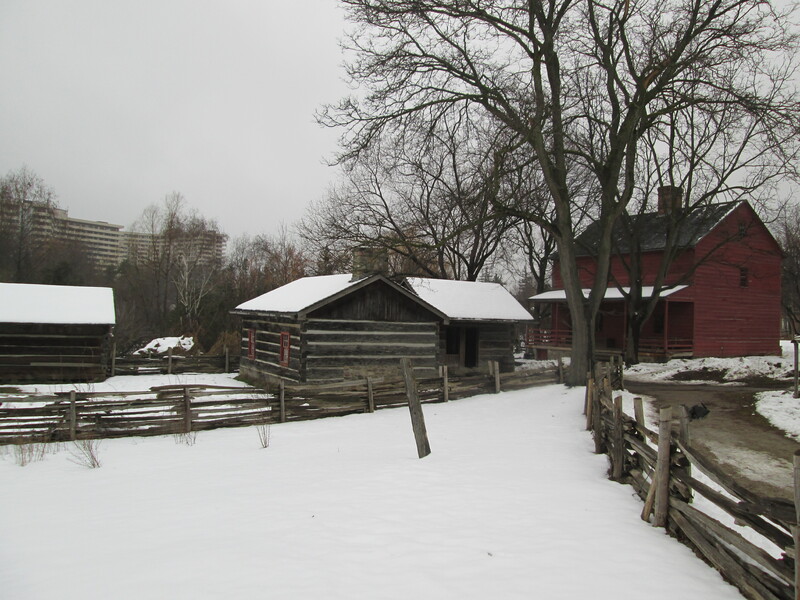 Black Creek Pioneer Village is in fact, one of our favourite places. It was 4 degrees with a light mist adding to the atmosphere of the historical buildings. Elizabeth Fisher was born on October 30, 1798 and was just 17 when she married Daniel Stong in January of 1816. Daniel was 24 and, like her brother, had served in the war of 1812. Elizabeth never knew her father who in 1796 had received the land grant for lot 25 concession 4 in York township, now the southeast corner of Jane and Steeles , but had died before clearing the land. Elizabeth had inherited the 100 acre lot when her brother died during the war of 1812. Daniel and Elizabeth arrived at her lot in 1816 to find a forest of giant oak and pine trees. Clearing land provided the wood for building their first home. Before winter fell they had completed the tiny three room log house that would serve them for the next 16 years. The fire place is seen in the stone set in the wall below the chimney. Inside, this provided the cooking hearth and a source of heat for the winter. In the early years Elizabeth had only the simplest cooking utensils, designed to work over an open fire. Some typical examples hang beside the fireplace. In 1817 Elizabeth gave birth to their first child, Mary Ann, followed by a second daughter the following year named Catharine. As the family was growing, Daniel was working on building a farm out of the virgin forest. Keeping livestock over the winter was difficult so it was common to butcher the animals in the fall and preserve the meat. A smokehouse was added right outside the front door in 1820. It was divided into two rooms, one for butchering and the other for smoking the meat. In 1821 the Stongs celebrated the birth of Jacob, their first son. A second son, John, was born the next year. Salted pork was one of the primary meats used to carry the family over the winter. Daniel raised pigs which he housed in his piggery. Being steps from the house made it easy for taking care of the animals but it must have smelt pretty nasty when the wind blew from the south. A grain barn was added in 1825 to the prospering farm. Between 1826 and 1831 Joseph, Michael and Samuel were added to the family bringing the total number of people in the three room house to 9. Daniel and Elizabeth had one bedroom, the two girls the other and the boys slept in the living room. 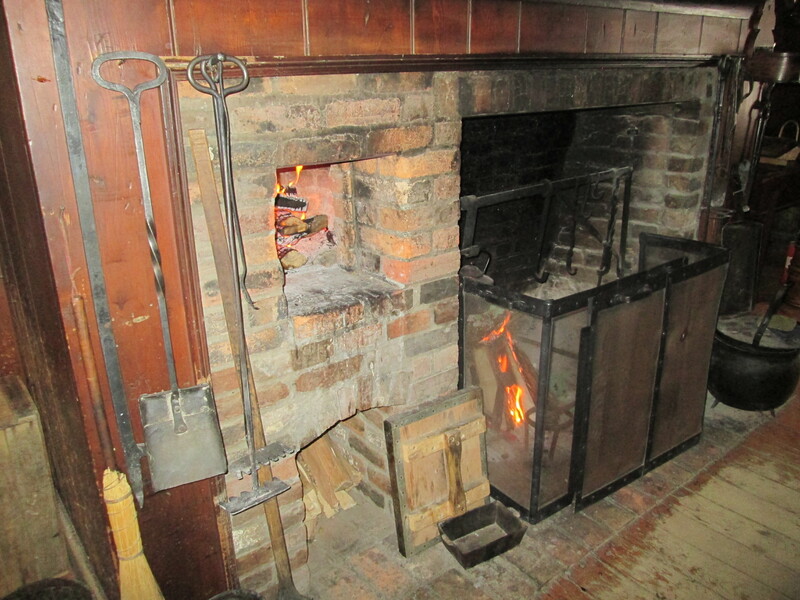 The boys had the luxury of being closest to the fireplace in the winter. In 1832 Daniel built a second home for the family. The two story red house in the picture below is where their 8th and final child, Daniel jr. was born. Shown in the picture from left to right are the piggery, first home, smokehouse and second home. This little homestead was where Elizabeth raised her brood of children. The second house featured a greatly improved cooking area complete with a seven second bake oven on the left side. If Elizabeth could hold her hand in the oven for more than seven seconds it meant that it wasn’t hot enough yet. 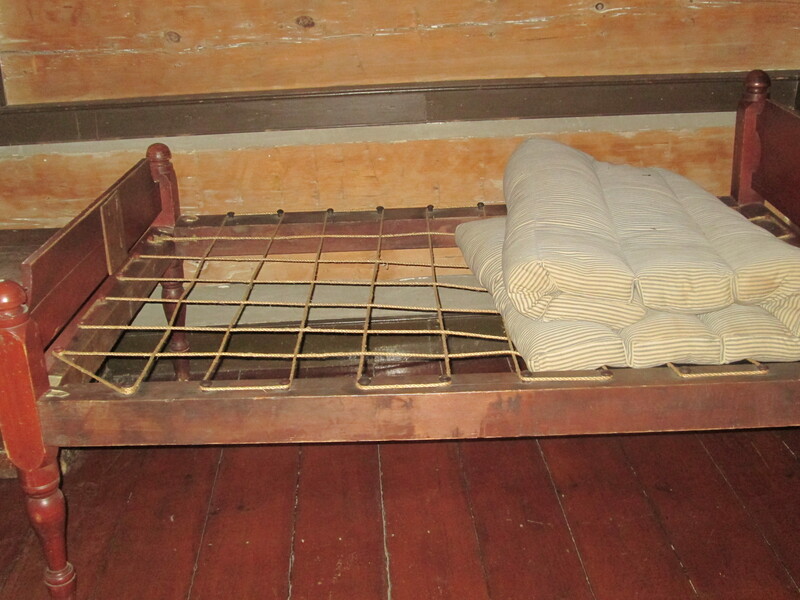 An old expression which will be familiar to most of us is “Sleep tight, don’t let the bed bugs bite.” This bed in the second home is turned back to display the ropes that supported the mattress. The ropes would need to be tightened frequently to allow for a comfortable sleep. In the rebellion of 1837 Daniel and his oldest son Jacob joined the rebel farmers and William Lyon MacKenzie to fight for responsible government. After the rebellion was crushed Daniel was arrested and held in jail. With the hangings of two rebels in Toronto, and 8 children at home to take care of, this must have been a horrible time for Elizabeth. Tragedy struck in 1845 when Michael died at the age of 17. 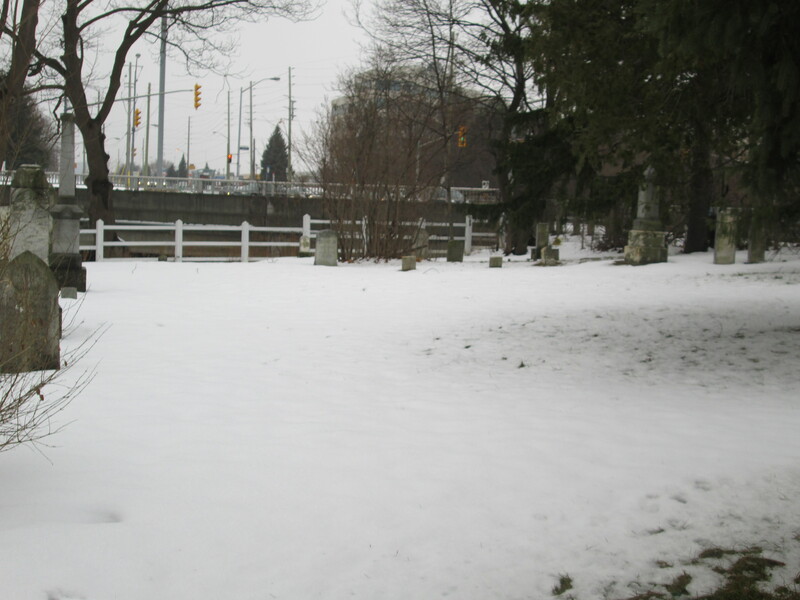 He was buried on the north west corner of the property in what would become known as Townline Cemetery. Eventually this cemetery would become the resting place for most of the Stong family and their neighbours. The land for the cemetery and Townline Church were donated by Daniel. In 1854 her oldest daughter Mary Ann died at the age of 37. That same year her oldest son Jacob bought the east 80 acres of the farm to raise his own ten children on. He built this two story brick house that still stands near the corner of Steeles and Keele. This old farmhouse once had a large front porch as can be seen in the changed brick colours below the upper windows and angling out to the corners of the house. In 1868 Elizabeth lost her husband and lifelong partner Daniel. The large family that she had borne became her security in her older years. Many of the adjacent farms were occupied by her children. 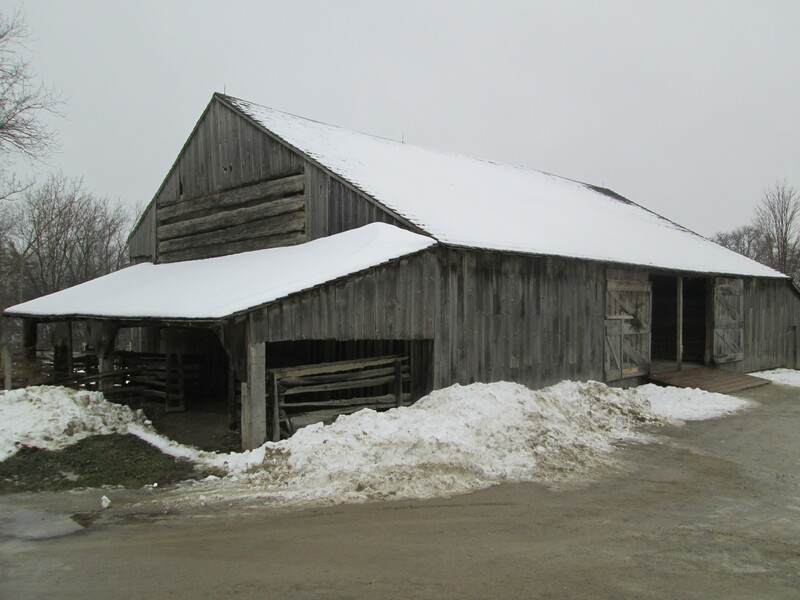 Samuel lived on the farm on the north side of townline (Steeles). The house from that property was built by the Stongs around 1855 and has been moved to it’s present location within the village. Elizabeth was to suffer the passing of her other daughter in 1882 before she herself passed on March 30, 1885. The farm was operated by Daniel, his son Jacob, grandson Alfred and great grandson Oliver. Oliver Stong farmed the family homestead until 1952. 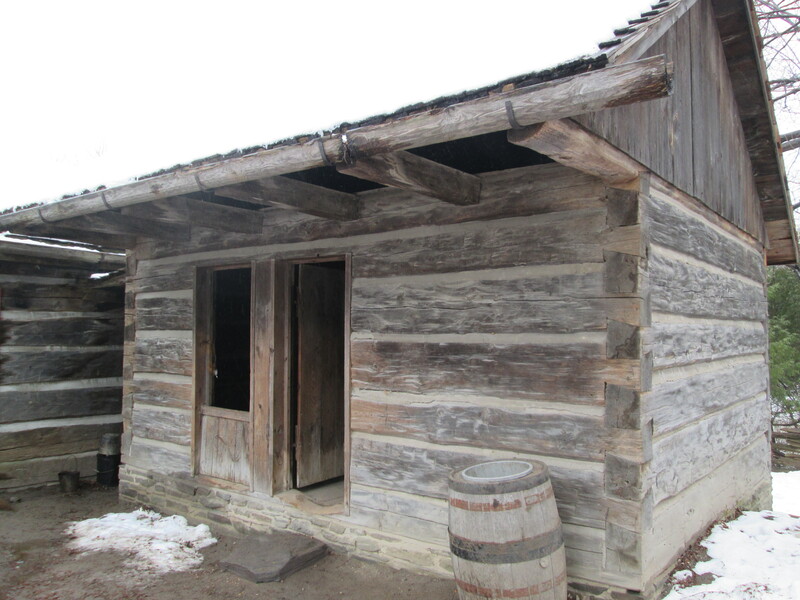 Unlike most pioneer families, the Stongs never tore down the early buildings to re-use the materials. 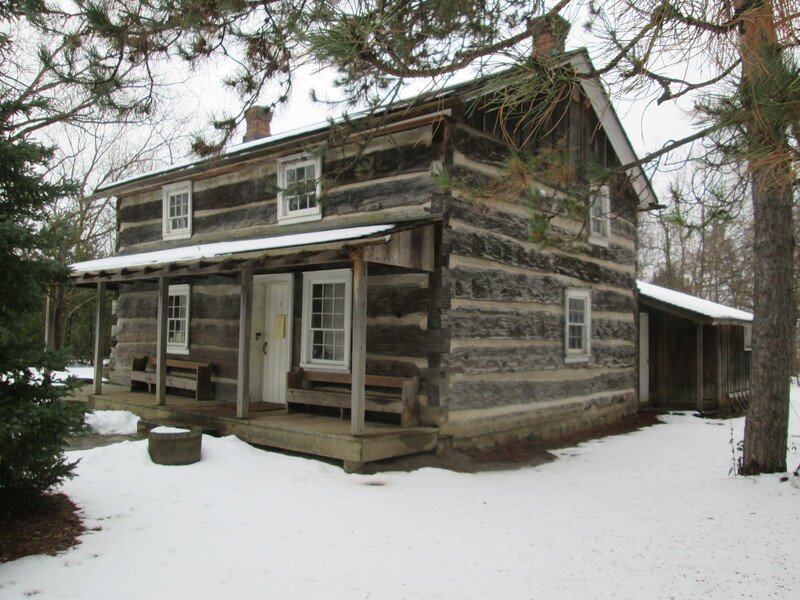 The property was purchased by the Toronto Regional Conservation Authority in 1958 because of it’s unique collection of historic buildings and opened as Black Creek Pioneer Village in 1960. The east end of the property is now home to York University. 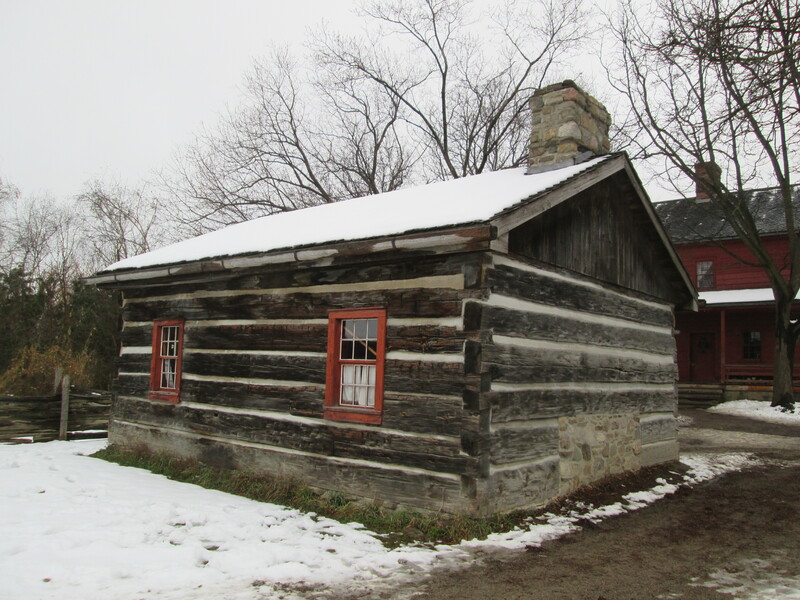 This entry was posted in Black Creek Pioneer Village and tagged Black Creek Pioneer Village, Daniel Stong, Elizabeth Fisher Stong, Log House on December 16, 2014 by hikingthegta.